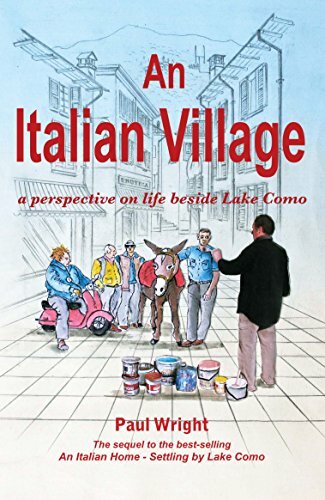 In this, the second book in his Italian Trilogy, Paul relays more enthralling real-life stories about Italian village life. Though Lake Como has always had a reputation for exclusivity, it is now one of Italy’s most expensive places to live. But alongside the high-fliers are the everyday people, rich, poor and all levels in between. In the sequel to the successful ‘An Italian Home - Settling by Lake Como,’ expatriate artist Paul Wright, a resident of northern Italy for over 28 years pulls no punches to give us his take on his Italian neighbours, workmates and clients. From time to time, he touches base with a group of men, retired from the restaurant trade, who spend their days seated around the fountain in the piazza of his home village of Argegno, making their own running commentary on the world as it passes by. Paul also travels outside the village boundaries too, to the surrounding Italian countryside, the Italian Riviera and Switzerland to work for all manner of clients, ranging from the reputable to the decidedly risky. After selling some of his trademark watercolours to an American couple, he visits the USA to paint a mural in their home in Vermont and enjoys a break in New York City, where he explores the art world.